This info is about Mise à jour de sécurité pour Windows Internet Explorer 8 (article KB2797052) for Windows. Below you can find details on how to uninstall it from your computer. It was developed for Windows by Microsoft Corporation. Further information on Microsoft Corporation can be found here. Please open http://support.microsoft.com if you want to read more on Mise à jour de sécurité pour Windows Internet Explorer 8 (article KB2797052) on Microsoft Corporation's page. The full command line for uninstalling Mise à jour de sécurité pour Windows Internet Explorer 8 (article KB2797052) is "C:\WINDOWS\ie8updates\KB2797052-IE8\spuninst\spuninst.exe". Note that if you will type this command in Start / Run Note you might be prompted for administrator rights. The application's main executable file is called iexplore.exe and occupies 623.84 KB (638816 bytes). Mise à jour de sécurité pour Windows Internet Explorer 8 (article KB2797052) contains of the executables below. They occupy 1.24 MB (1297760 bytes) on disk. This page is about Mise à jour de sécurité pour Windows Internet Explorer 8 (article KB2797052) version 1 only. 1. If you don't have Advanced Uninstaller PRO on your Windows system, add it. This is a good step because Advanced Uninstaller PRO is a very useful uninstaller and general tool to maximize the performance of your Windows system. 2. Start Advanced Uninstaller PRO. It's recommended to take some time to get familiar with Advanced Uninstaller PRO's design and number of features available. Advanced Uninstaller PRO is a powerful system optimizer. Star rating (in the lower left corner). This explains the opinion other people have about Mise à jour de sécurité pour Windows Internet Explorer 8 (article KB2797052), from "Highly recommended" to "Very dangerous". The uninstall string is: "C:\WINDOWS\ie8updates\KB2797052-IE8\spuninst\spuninst.exe"
7. Press the Uninstall button. A confirmation window will appear. accept the uninstall by clicking Uninstall. 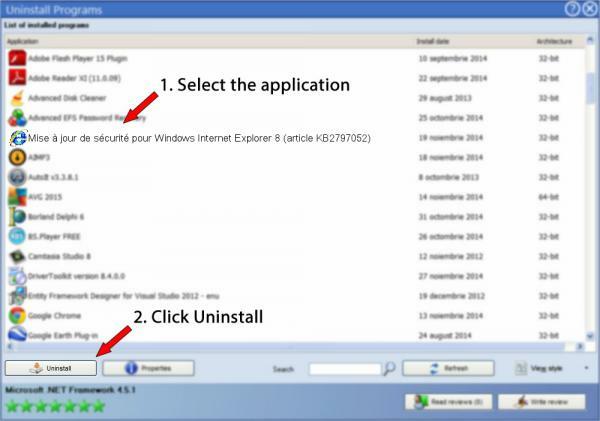 Advanced Uninstaller PRO will then remove Mise à jour de sécurité pour Windows Internet Explorer 8 (article KB2797052). 8. After uninstalling Mise à jour de sécurité pour Windows Internet Explorer 8 (article KB2797052), Advanced Uninstaller PRO will ask you to run an additional cleanup. Press Next to perform the cleanup. All the items that belong Mise à jour de sécurité pour Windows Internet Explorer 8 (article KB2797052) which have been left behind will be found and you will be asked if you want to delete them. By removing Mise à jour de sécurité pour Windows Internet Explorer 8 (article KB2797052) with Advanced Uninstaller PRO, you are assured that no Windows registry entries, files or folders are left behind on your PC. The text above is not a piece of advice to uninstall Mise à jour de sécurité pour Windows Internet Explorer 8 (article KB2797052) by Microsoft Corporation from your PC, nor are we saying that Mise à jour de sécurité pour Windows Internet Explorer 8 (article KB2797052) by Microsoft Corporation is not a good application for your computer. This text simply contains detailed info on how to uninstall Mise à jour de sécurité pour Windows Internet Explorer 8 (article KB2797052) supposing you decide this is what you want to do. Here you can find registry and disk entries that Advanced Uninstaller PRO discovered and classified as "leftovers" on other users' computers.